Gorilla trekking in Rwanda is one of Africa’s most interesting safari activities as it attracts more visitors in this country than any other activity in Rwanda. Rwanda has the second largest portion of the total mountain gorilla population in the world after Uganda. Many travelers prefer going to Rwanda especially for primate watching safaris and this is the reason why the country has greatly improved when it comes to tourism. Also referred to as as the land of a thousand hills; Rwanda offers the best atmosphere for tracking mountain gorillas. The only national park in Rwanda where mountain gorillas can be tracked is Volcanoes National park in the northern parts of the country about 85km from Kigali capital city. Volcanoes National park records the highest number of visitors and these come specifically to track these primates. Volcanoes National Park covers an area size of 130km² covered with scenic and forested mountain ranges and also 6 volcanoes. The park is a home to the endangered mountain gorillas harboring about 300 of them, making it one of the most populated national parks with the gorillas. One of the things that have made Volcanoes National Park popular is that it is where the iconic and legendary mountain gorilla conservationist, the late Dian Fossey. Today, her grave is found at the heart of the park and has turned out to be a Rwanda safari tourist attraction. Many tourists especially those interested in learning more about her history have come over to view it. 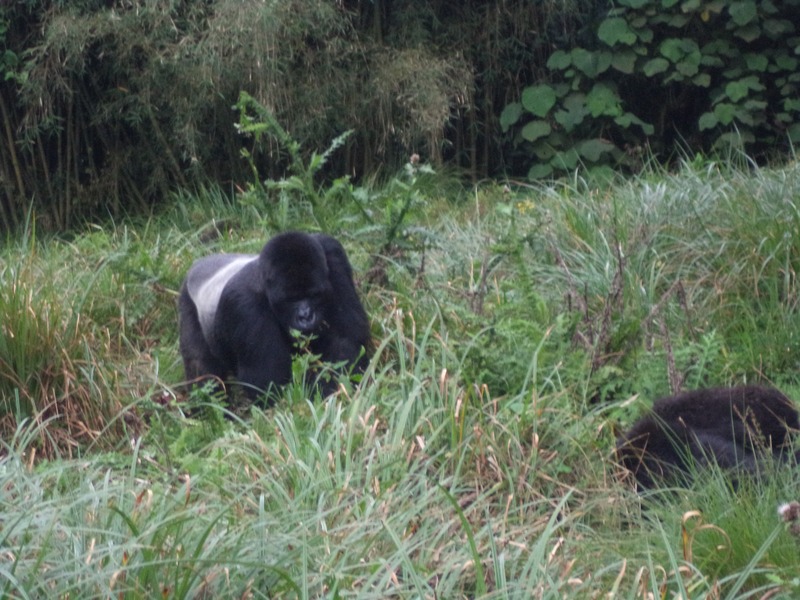 The main reason for picking a Rwanda gorilla trekking safari instead of others is that it is less strenuous and the gorillas in this park move around the whole park making it easier for tourists to encounter them. The wonderful scenic views of the volcanoes are also breathtaking and give better views for taking spontaneous photos. A Rwanda gorilla trekking safari is much easier because in Rwanda travelers purchase gorilla permits which allow them to trek any gorilla family of their choice in Volcanoes National Park. Just Like in Uganda, a traveler intending to go gorilla trekking in Rwanda is required to obtain a gorilla permit which is issued by the Rwanda Development Board, Rwanda’s tourism governing body costing $750 per person.